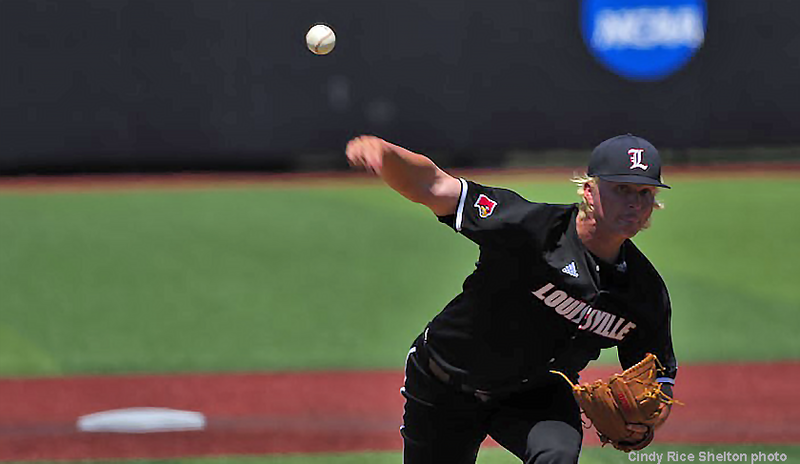 The sight of Sam Bordner confined to the bench, unable to help his University of Louisville teammates, was one of the most disappointing aspects of the 2016 college baseball season. UofL could have gone a long way with him at full strength. An arm injury brought Sam Bordner’s college career to a premature end (Cindy Rice Shelton photos). Bordner was not available at the end, suffering from an inflamed elbow on his throwing arm. He would miss the last month and a half of the season, and would undergo Tommy John surgery on his right arm. 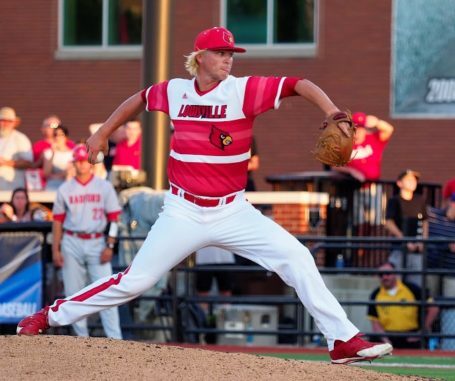 On Thursday came the final lines to his UofL story, Bordner confirming what many UofL fans suspected he would do, he signed a professional contract with the Miami Marlins. He had been picked by Marlins in the 16th round of the draft, lower than this observer expected. At 6-foot-6, 240 pounds, Bordner was an imposing image. Add to that those shoulder-length strands of blond hair falling out of his hat and a scorching fast ball, he was downright intimidating to some batters. Bordner was named an All American following the 2017 season, compiling an amazing 0.41 earned run average in 43.2 inning and 23 games. Didn’t allow a run in 22 or 23 innings. He was on the mound when UofL eliminated Kentucky to earn its fourth trip to the College World Series. He seemed ready for a dominant season in 2017, picking up eight saves in his first 11 appearances. The first signs of problems came in successive games against Florida State and North Carolina State. He would be the loser in both games, giving three runs to the Seminoles and four runs the Wolfpack, in the bottom half of the ninth inning in both games. He wound up with 10 saves for the season.